lives in London Since her stay at the Rijksakademie in Amsterdam Runa Islam has been making films with the purpose of analyzing the characteristics of the medium itself, within the meaning of feature films and cinema. She inherited this need for analysis during her art history and philosophy studies. What fascinates her is the build-up of a narrative structure, the relation between film and reality, the possibility to create an illusion with filmic elements. Her research into film in turn becomes a film, but, however, short and powerful, mostly just a few minutes long. She focuses on one moment or one story segment. Sometimes she narrates herself, sometimes she finds a starting point in an existing film. 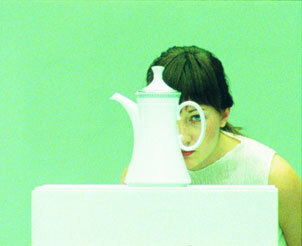 In Garden (1998), for example, she re-enacts a scene from Fassbinder’s Martha (1973), simple but crucial to Runa Islam. She reconstructs the encounter of a man and a woman in a park like in the Fassbinder film and films it twice: one time from the point of view of the man, the second is from the point of view of the woman. She also immediately reveals the camera positions. Her fragmentary and analytic approach emphasizes the core emotion of the image, the human incapability to make contact and communicate. Her work is always about intense observation. And she also expects that attitude from the spectator. Be The First To See What You See As You See It: in a way, she gives the spectator a large amount of freedom to interpret what he sees before him with his own eyes. Still, the image is meticulously composed and timed, so that it is closely connected to the essence of the film: a play between time and space, between the view of the artist through the camera and that of the spectator, a play where nothing is certain. What did I see, what did I miss, the spectator wonders. A young woman walks through a store and looks at the porcelain crockery displayed. With the defiant attitude of a child, she starts bumping against it until it falls. Is this a feminist gesture, an action against the role patterns, that have a woman pegged down as doing the household chores? Or is there a social undertone? The porcelain, present in many British homes, can also be seen as a symbol of bourgeois, conservative stiffness or to the emotionally charged history of British colonialism. James Westcott, a critic for the NY Arts Magazine, looks at it from phenomenological point of view: “…a phenomenological reading is richer: it’s a plain and pure encounter with the implacable objecthood of objects, a testing of their limits, and an attempt to see what they are with no associations or expectations.” Does anyone have any other ideas?